There are enough kitchen gadgets to fill entire stores. But ask a chef for advice and they will likely tell you their essential tool is a good knife. In the kitchen, a knife is as important as one’s fingers as they are an extension of a chef’s hand. Your ambitions may not include being a professional chef; however, having the right tools and know-how to use them is a great skill when it comes to efficiency in your kitchen. There are wide array of knives. What ones do you really need? Serrated Slicer (or boning knife): is often used for cutting meat or fish, generally a longer blade. Blade can be straight or serrated. Beyond this list, there are specialty knives such as cleavers and fillet knives. Find the knife that best suits you. Hold the handle. Do you like the material, the shape, the weight? Is the blade a comfortable length? Care for you knife. Knives are easily dulled if used and stored improperly. Keep it clean but don’t put it in the dishwasher. Despite how much you like your knife, don’t try to catch it if it falls. Get your hands and toes out of the way. 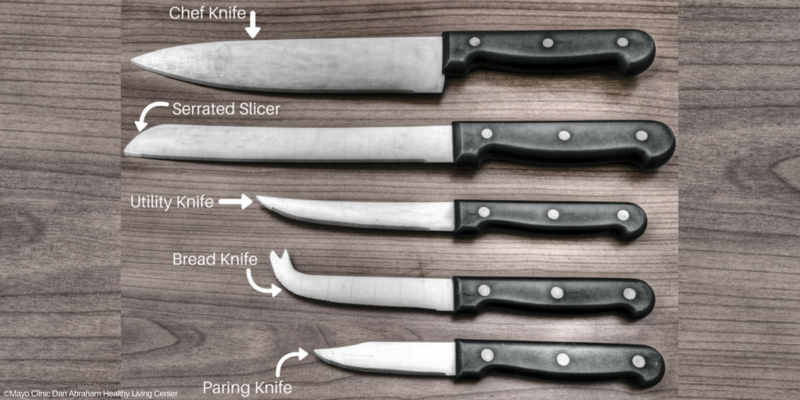 Want to know more about knives and how to use them? Join our chefs and dietitians for culinary classes. We offer a variety of classes to include one specific to knife skills – Wielding a Knife. Let us help you be more confident in chopping, slicing, and dicing veggies and fruits. Source: The Professional Chef, the Culinary Institute of America, Chapter 5.